The project is currently immature, raw, and very far from finished – but this post covers some of the basics of what it is, and what it will grow into. 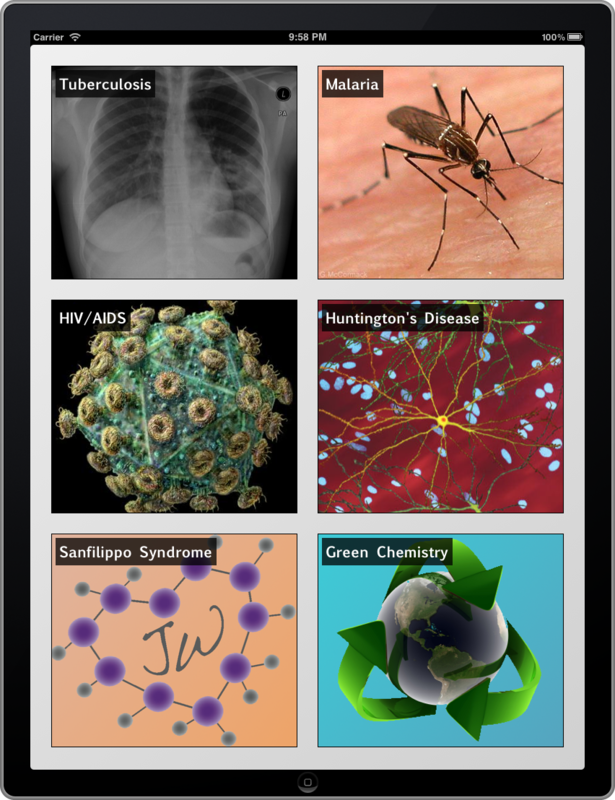 From the outside looking in, ODDT is a free app that works on iPhones, iPods and iPads. The layout and mode of user interaction is unashamedly inspired by Flipboard, which to anyone who hasn’t already tried it, has a user experience well worthy of imitation. The cover starts out by presenting a variety of topics, as shown on the right. The topics that we’re starting with include tuberculosis, malaria, HIV/AIDS, Huntington’s disease, Sanfilippo syndrome and green chemistry: six topics that are already amenable to open research, either because they are underfunded, as is the case for rare or neglected diseases, or are generally considered more of a public good than a competitive advantage, as is the case for green chemistry. Each of the topics, once it is opened, displays a stream of news items. These are currently harvested from Twitter, by looking for specific hash tags. The Twitter infrastructure makes a great starting point for a source of news, because it has an open API, everything on it is public, and it is immensely popular. It is already being used by a number of scientists, in addition to many more people who have an interest in scientific research topics. If you click on the first image at the top, a more detailed view will reveal that the page is taken up with a number of individual sections, many of which are culled from tweets. Most of these contain at least one link, and the links can be tapped on to open an inline browser, to see what it’s about. Other entries lead to data that has been recognised as marked-up chemical content: you can tell these, because the content is displayed inline. 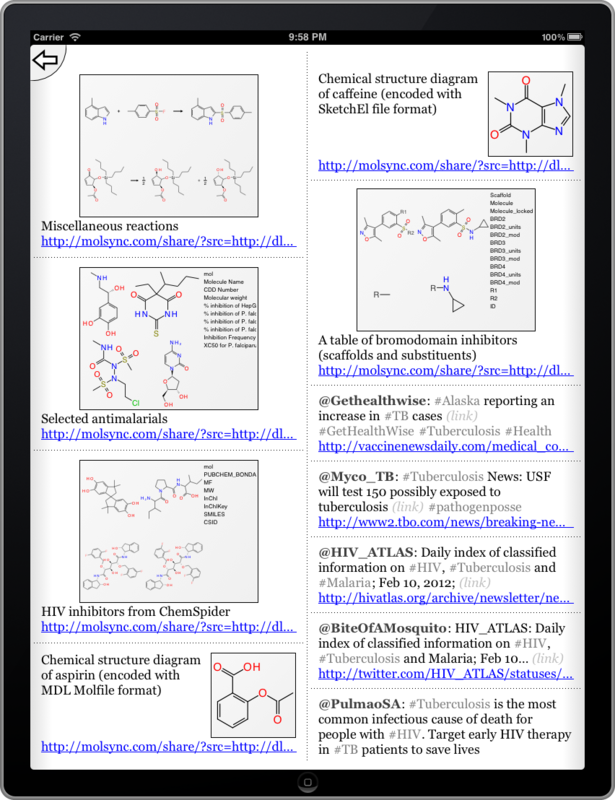 Molecules, reactions and datasheets are processed intelligently by the front-end app and the back-end server, and opens up a whole slew of options for making use of this data, such as detailed viewing, passing to other apps, or sharing it as part of a workflow. At this very early stage, the ODDT project can be summed up as a kind of focused Twitter client with some chemistry-specific value added features. Which isn’t bad considering that the first line of code was written less than 2 weeks ago. One of the many appealing properties of this project is that it can be useful almost immediately, and can be ramped up steadily as it evolves. For example, the variety of different types of links and source data worthy of special treatment will grow. The server will likely start caching chemical data, allowing it to be sliced, spliced and searched. Other sources of topical information will be sought, and methods for injecting new content, besides tweeting, will be introduced. The concept of a subscription to particular topics will be developed, and this will morph into actual team membership. In this way the project will increasingly become a domain specific social network, rather than solely a content consumption interface. In our discussions, Sean and I have decided to make progress on the ODDT project publicly available more or less real time, via blogs and various announcements. It seems appropriate, since the subject data is basically open science. And we are interested in hearing any feedback, at any in the development cycle – and if you’re interested in getting involved, let us know.